Shop River Island sale now! Oh my... I look so glum in that first photo! I seemingly managed to crack a smile in the last two snaps though, so excuse the face. Like my cute coral beanie? Brings a bit of brightness to my glum old face I reckon! I spotted it in the River Island sale while they had free delivery for £3 - around the price you'd pay in Primark. I don't really own any statement accessories, I think this hat may be my first, and what a good'un it is. I feel a bit like a beacon of... coral-ness in it, but I do like it. The t-shirt was another River Island sale purchase. It was only £10 and I really like the hi-lo fit, although I think I will have to wear high waisted bottoms with it as having a strangely long body the front comes up a little high for my liking. The gold studs on the neckline means I don't have to faff with a necklace - handy - and the back of the top is just gorgeous. It doesn't come down too low for it to expose my bra (one thing I despise about cut out backs on tops! ), but it's still a little bit sheer, so I popped a vest top under it here. The material creases pretty easily, not ideal for someone who irons with hair straighteners (I kid you not. ), but it's bearable! This ones sold out online, but it might still be around in stores. Have any of you grabbed any super sale items recently? Ps. thanks to Tasha for her recommendation of putting Vaseline onto the tough bits of my docs! It worked a treat it would seem! 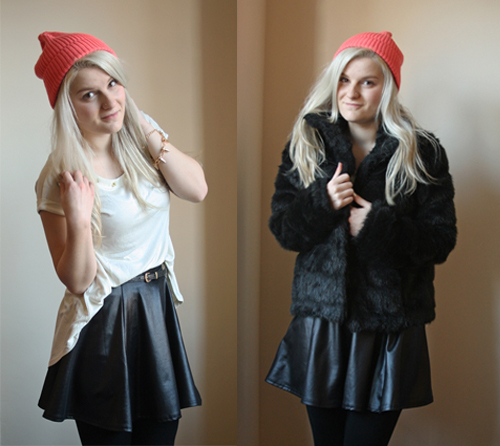 Some amazing sales around at the moment :-) I love that jacket. Love this outfit! The skirt and top are especially gorgeous! Adore the colour of your beanie! Love the boots and the skirt! !